A faint pattern of cherry blossom petals decorates window screens and furniture inside this tea house in Japan by Hiroyuki Ogawa Architects. Tokyo architect Hiroyuki Ogawa converted an early 20th century building in Kanagawa to create 'Cha no Chimoto' – a tea house for a Japanese confectionary company whose speciality is a rice cake known as Yumochi. Read in Japanese, the name of the tea house can be understood to mean "one thousand cherry blossoms", which is a reference to a Japanese play. The architect used this motif as a basis to decorate the interior. "Our design goal was to use the cherry blossom symbol of Chimoto to evoke a traditional Japanese spirit," said the studio in a statement. There are few straight lines inside the tea house. Curvy walls frame the edges of the space and a bowl-like counter is located to one side. The studio said the curved shapes are intended to evoke an "impression of softness" in the room. Rounded tables and white chairs furnish the space, while paper window screens feature lines intended to look like cherry tree branches. Sections of gauze cut into petal shapes were arranged over the surfaces of the table and counter, before being coated with a polyester resin to hold them in place. 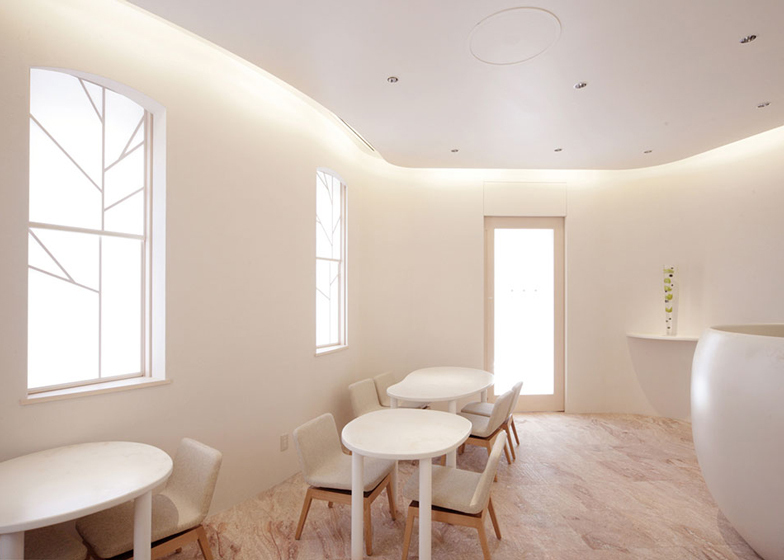 "We succeeded in suggesting a spring scene of fluttering cherry petals with the cherry blossom motif used throughout, and suggesting the Yumochi made by Chimoto with the soft white walls and curves of the furniture," the team added. White curtains shield a kitchen and food preparation space at the rear of the shop, while a traditional fabric curtain – known as a noren – covers the tea house entrance. The site in Hakone is well-known from long ago as a hot spring district. In Hakone, there is a white western-style building that was constructed in the early 20th century, and this building has become a local landmark. Our client, the Japanese confectioner "Chimoto", has a history stretching back more than 60 years, and they are currently operating this building. The name "Chimoto" comes from "a thousand cherry blossoms". It is said that the founder named it this after getting the idea from the title of "Yoshitune Senbonzakura", a play in the traditional Japanese performing art of Kabuki. Chimoto's main attraction is a soft, white rice cake called "Yumochi", and customers visit the shop from all over Japan in search of it. We worked on the preservative repairs of this locally important building, as well as the interior of our client's new Japanese confectionery and tea house "Cha no Chimoto". Our design goal was to use the cherry blossom symbol of Chimoto to evoke a traditional Japanese spirit and create new expressions without falling into nostalgia for the old days. Walls: We covered the surfaces that had become warped by repeated extensions and alterations to the building with curved walls and finished them with diatomite plaster. By doing so, we changed the disharmonious surfaces to give an impression of softness. Windows: For the windows, we installed glass windows with sliding paper screens called "yukimi shouji", and put representations of cherry trees on the paper screens. These paper screens symbolically link the scenery visible through the window with the interior. Furnishings: For the guest seating tables and large bowl-shaped counter, we replaced the traditional Japanese technique of lacquering with a modern polyester resin material. Gauze cut into the shape of cherry blossom petals was arranged on the surface of the furniture and coated with polyester resin, followed by a process of repeated polishing to give the cherry blossom petals a sense of depth. As a result, we succeeded in suggesting a spring scene of fluttering cherry petals with the cherry blossom motif used throughout and suggesting the "Yumochi" made by Chimoto with the soft white walls and curves of the furniture.